Color: Liver and white, and orange and white are standard, but roan and bi-color are also accepted. Coat: Flat to wavy coat with firm, non-silky and non-wiry hairs. Minimal feathering. 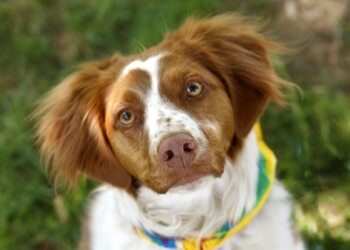 Is a Brittany the Right Dog Breed for You? Brittanys are known for their lively, friendly temperament. They were originally bred as a hunting dog and have great ability to track scents and retrieve. They are loyal and trustworthy and have excellent trainability owing to their intelligence. They can be well suited to urban and rural settings and are great with children. Early socialization and close human contact are necessary. They have a high barking tendency and can be good watch dogs. They have a tendency to roam and should be let off leash only in enclosed areas to prevent wandering. Grooming needs are low, but they do require significant daily exercise.